Tonight I pitched my two year old okra. I completely understand. I mean, I couldn't hold onto okra for two years, I can barely keep it around for two weeks. But I understand how sometimes you gotta throw stuff away. 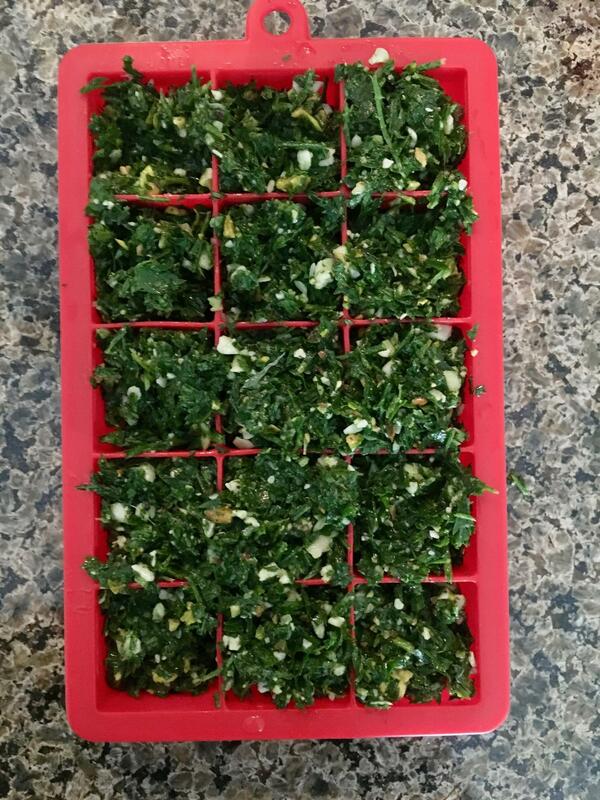 Fermenting garlic paste, which is seasoned with cumin, pepper, and lemon. Two different jars of the same vinegar-pickled jalapenos with horseradish. (I enjoy peppers in just about everything, pickled or unpickled). It's been two hundred degrees in here, which apparently is about as functional for pickles as it is for rising bread. But I thought I'd try to take advantage of the cool-ish week we're having to get the party started. Ronnie found me some Palisade peaches from Colorado. The best peaches I've ever had. The sweet juice runs down your arms when you bite in. So, I canned 6 quarts in medium syrup, saved 6 to eat and have enough left to make a cobbler. I kinda want some more, but.....I have enough on my plate I guess. I always think I can get more done in a day than I actually do. I need to set my goals a lot lower so I'm not disappointed in myself. I miss Palisade peaches. And apricots. And Olathe corn. It was tomato day. 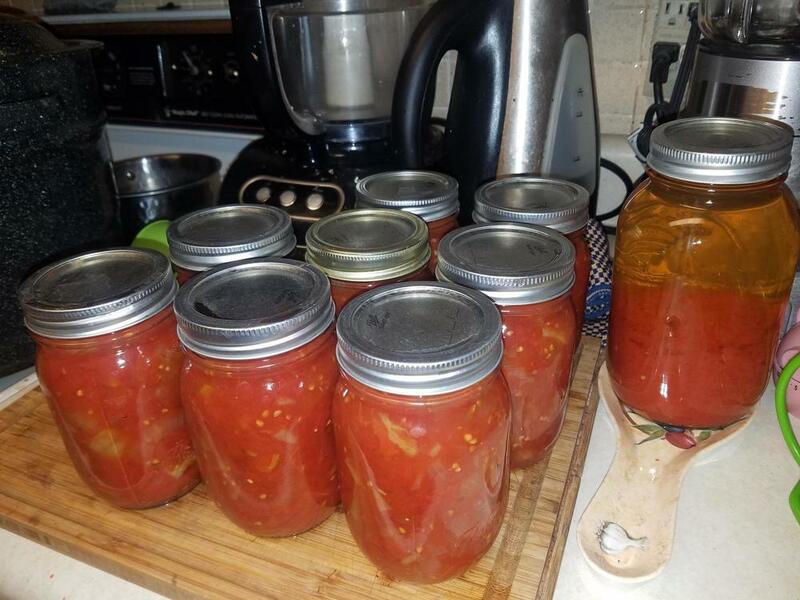 About 25 pounds of tomatoes yielded 13 pints of tomato relish, 2 quarts of tomato juice, and about six half-pints of tomato sauce made from peels and cores, to be canned tomorrow because I had no half pint jars. The rest is in the canner. And when this canner's done, I'm going to bed. Today was gooseberries. The first pic is 8 cups of cleaned gooseberries. The second pic is the jam. Mmmmmmm! Oh I haven't had gooseberries in years and years. Majorly jealous. @ShelbyThis was the first time I've picked and used gooseberries. 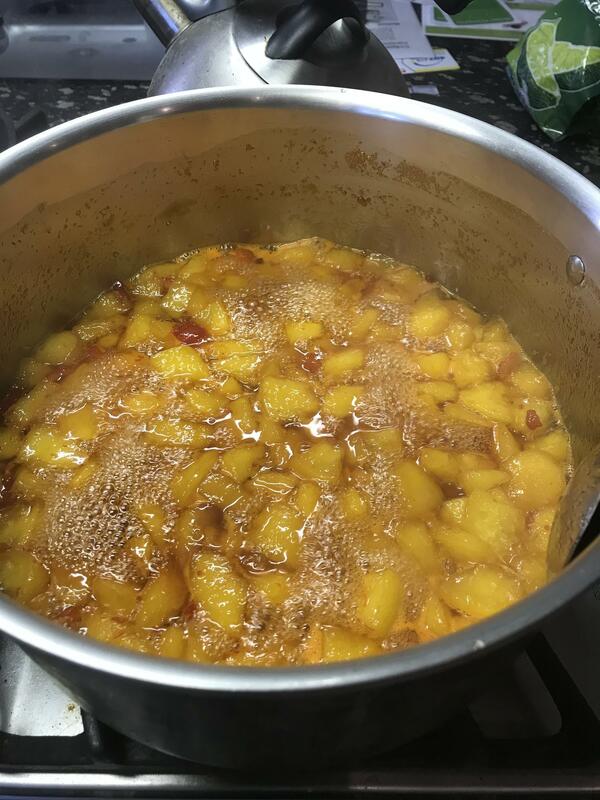 My granddad and great uncle used to love gooseberry jam, so that's where the idea came from to try and make jam. Made a rookie mistake while picking.... The berry bush is fenced in, and the owner told me how to open the fence, so I did. But, apparently not enough. Ended up getting my head stuck in the bush- which was awful- as I have long hair. Those pickers are something else! There was an additional 4 cups of berries leftover- so those are getting mixed with fresh blueberries and spread across cheesecake for dessert. YUM! No pics, but just finished canning 2 batches of blueberry jam. 12 c total of blueberries, and there are still 2 quarts left to wash and freeze. OY! Lotta pickling and canning going on in this kitchen. And, of course, more tomatoes. I will be attacking them again today. In the lunch thread, I mentioned that I made a carrot top and pistachio pesto, and @Shelby suggested I post the pesto cube picture here. I never really thought of pesto as a preserve, but I guess it is. Canning is one thing I've always been a little intimidated by, but I hope to try it soon. Succeed or fail, I'll post my results here. Peach and red pepper sauce under construction. today I did something called "lekvar", we guess it came to us from Hungary. 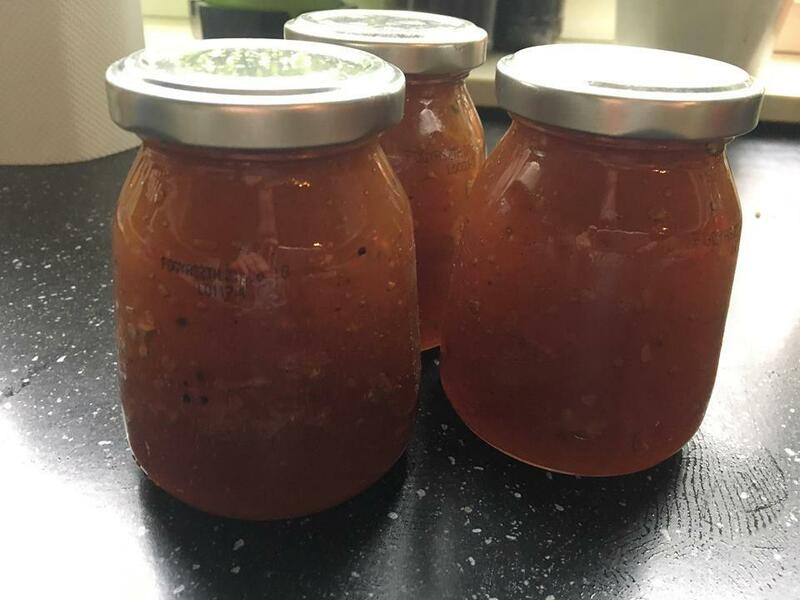 I made it from white onions and cooked it until it became almost a jam. Sweet with a sour twist. Delicious with any cold cuts. 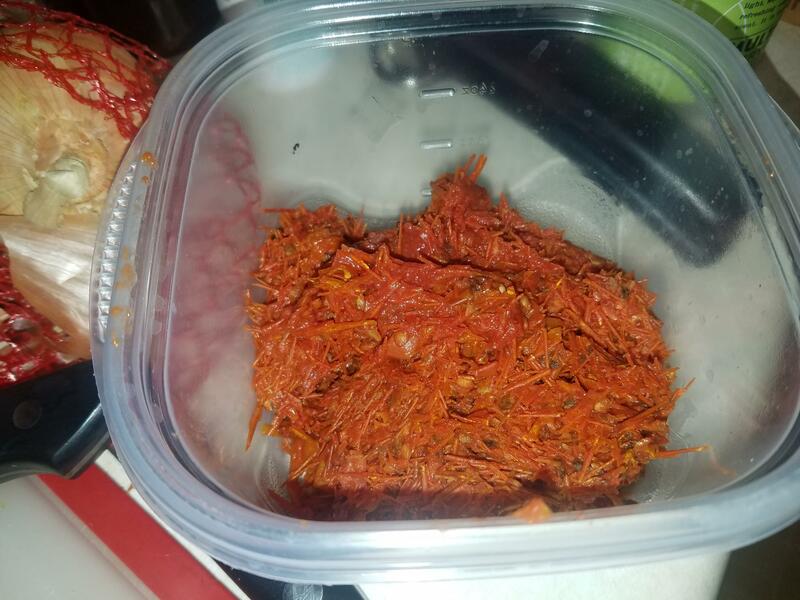 Nothing on the scale of what some of you do, but this was 12 pounds of plum tomatoes dehydrated to 3 1/2 pounds. 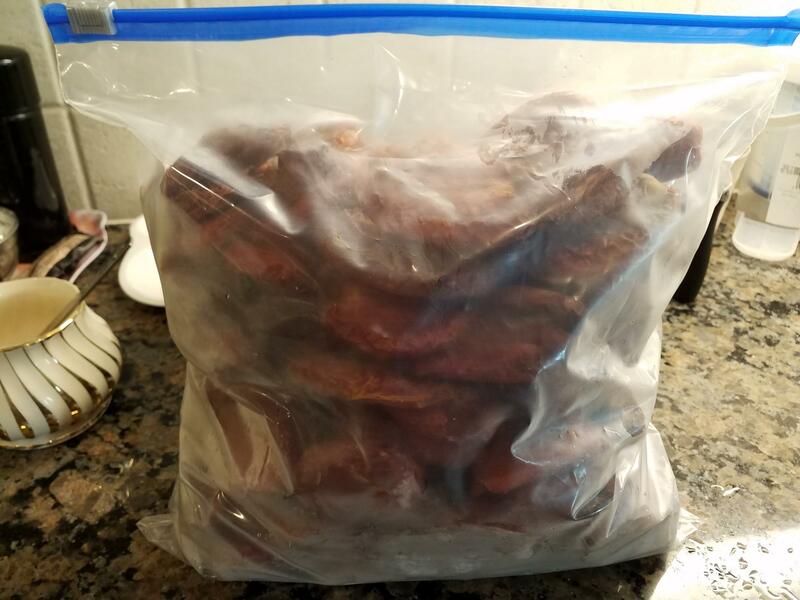 They are not 100% dried, as I wanted some of the juice to stay in them. They are in the freezer. I refer to those as "tomato candy." I'll get out a bag to cook with, use what I need, and eat the rest as a munchy. I bought tomatoes at the Farmers' Market today and am planning on making the "tomato parmesan chips" referenced somewhere on eG yesterday. Couldn't stop thinking about them. My wife has been running our dehydrator for a couple of weeks with no end in sight. She's still working on basil I think. Maybe a third of the way through the herb garden. Yesterday we made pickled carrots and bread and butter pickles, both for water bath canning. Janet made some kind of soup (I had a project in my lab and missed that part) that together with my carrot and ginger soup will get pressure canned today. We bought a small chest freezer this year. It has had a big impact on shopping and frankly on the organization of our kitchen freezer. My wife has made a number of things while I'm traveling to freeze now that we have space. We both like canning for shelf stable storage but the pressure canner gives her the heebie-jeebies *grin* when on her own. With the new chest freezer I'm going to have to take another look at what we can run off our little generator during power outages. We are getting pretty close to capacity. Have to love libraries and by extension librarians. Which for some reason leads me to a question. We mostly use pints and quarts; my wife uses 4 oz jars for jam. What do people use half-gallon jars for? When I see them I want to buy them for no reason I can put my finger on other than being a boy. *sigh* What would I do with half a gallon of pasta sauce? What do y'all use them for? Big families? I mostly see the big jars used for things like pickled eggs and pickled sausages. They'd probably also be a convenient size for fermenting sauerkraut. Exactly what I use mine for, as well as the occasional storage of juices. Here's the reference, for those interested. I am one of them. Did you do them yet, kayb? 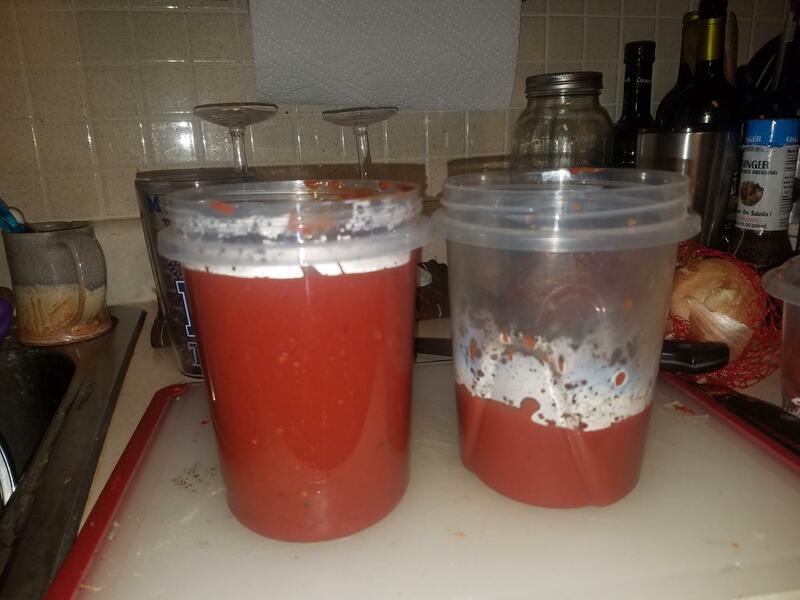 My husband's daughter and I spent the Labor Day weekend making salsa. It's our third year doing so, and we're getting it down to a fairly efficient process. Unfortunately, the fellow who got us started on this with his bumper crop of tomatoes, peppers and onions has stopped having bumper crops. We've gone to the local produce farm instead. 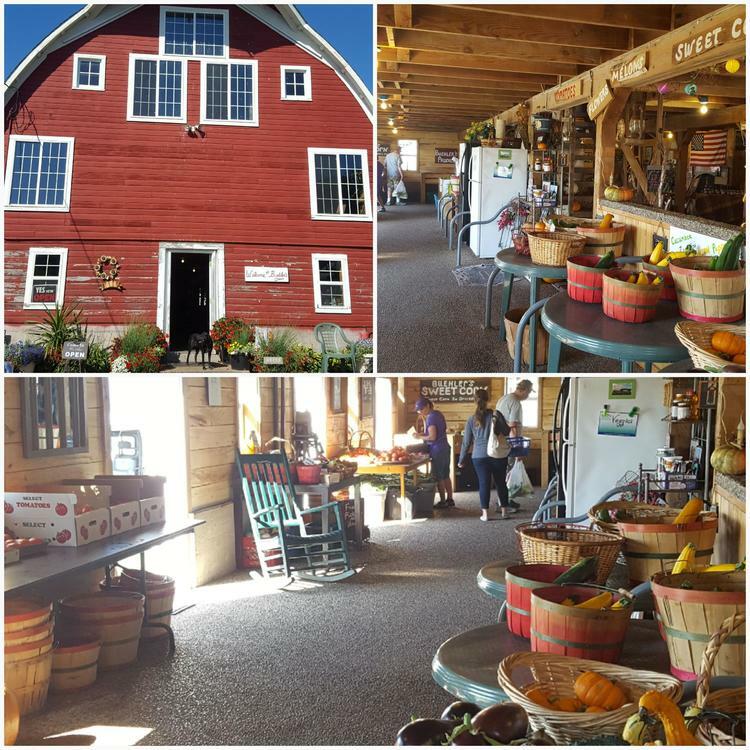 Buehler's Produce has a barn loaded with tomatoes, squash, spuds, eggplant, a great variety of peppers, and (in the refrigerator) green beans, cabbage, okra, and surely some things I'm forgetting. Truckloads of freshly-harvested sweet corn kept backing up to the building, and customers kept leaving with corn almost as quickly as it came in. It's a nice, meditative way to visit as we chop. 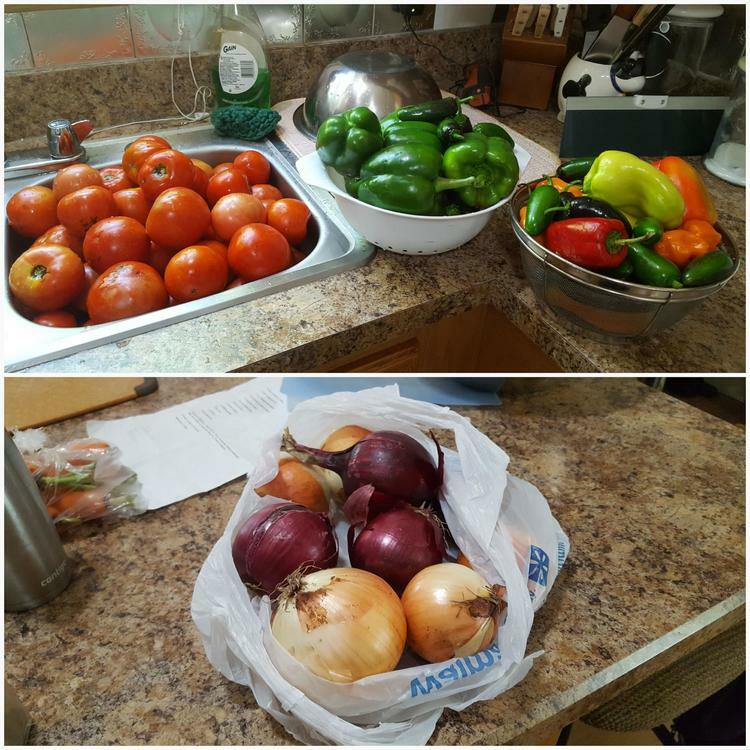 She did the tomatoes, I did the peppers and onions, with some assistance from her mother-in-law. The recipe calls for roasting it all in an oven pan. We tried cooking it on stove top the first day, and it took forever to cook down. We suspected it would, but the pot seemed more manageable than giant pans on baking sheets, so we gave it a shot on the first batch. After that we resumed oven roasting. The left top pan is before stirring; the right top pan is after. The bottom is what it looks like after 2 hours. 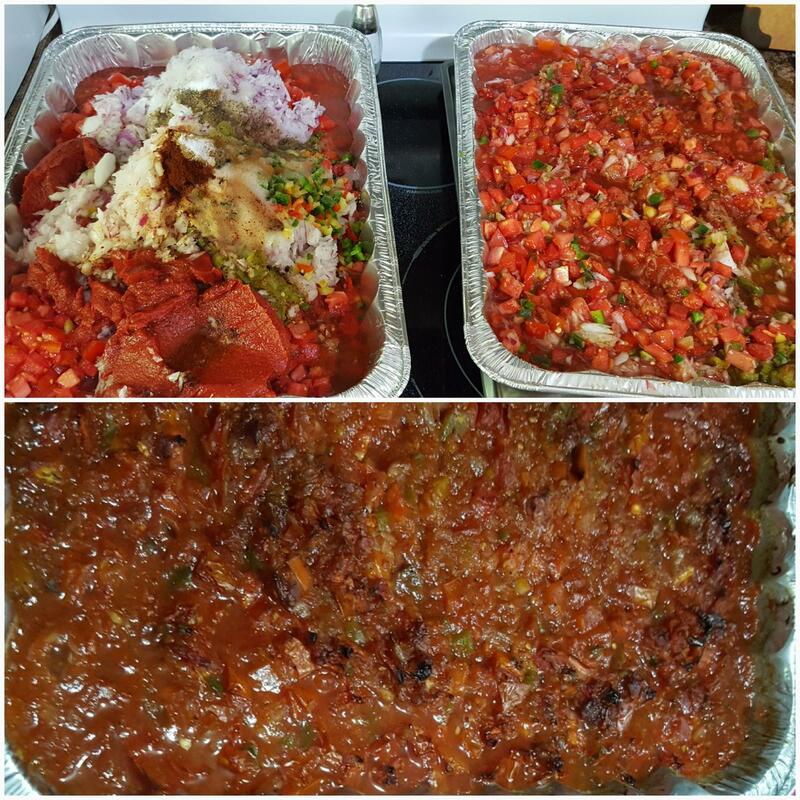 We've canned 48 pints of this salsa, with varying heat levels. Sheer gold, I tell you. I'm tempted to do more, but I also want to try the aforementioned tomato parmesan chips. The road to hell is paved with good intentions. Didn't get to it. Ran around like the proverbial beheaded chicken all day, and accomplished very little. I did managed to not go into a favorite farm stand when I had to make an unexpected run to the next town up the road to rescue my daughter, whose battery had died on her car. @ElsieD I'm thinking about dehydrating some tomatoes for the first time....I'd like to have some to put on pizza over the winter. I can't tell in the picture and maybe this is a dumb question but did you slice your tomatoes or are they left whole? @Shelby I cut them in half, and didn't do anything more with them than that. No oil, salt or pepper. These were plum tomatoes.